We begin with the words about our controversial Secretary of Education, Betsy DeVos. After her stumbling interview on 60 Minutes, Sunday, March 18, 2018, she was, among the least unpleasant thoughts, called “incompetent and dangerous” by The Alliance to Reclaim Our Schools (post 3/23/18). Be that as it may, neither DeVos nor Trump got what they expected when Congress passed the FY 2018 Omnibus Spending Bill, March 25, 2018, to allocate money to nearly everything in the country. DeVos’ pet project to cut Title II funds which provide federal money for professional development and smaller class sizes was increased. In fact, most commentators say that Congress did what it wanted, not what the current administration wanted. For education, Title I, IDEA, 21st Century Community Learning Centers, Career and Technology Education (CTE), Impact Aid, Pell grants, and Public Service Loan Forgiveness (PSLF) received more money than was scheduled in the 2018 budget. Even the Secure Rural Schools (SRS) Act, which sunset years ago, was re-authorized. And who would believe it, the Center for Disease Control and Prevention was given funds to study gun violence prevention. In addition, federal funds earmarked for school safety programs are prohibited from using the money to buy firearms and/or train teachers to use them in schools. We say that students calling out have made some change happen. Heads up! The 19th Anniversary of the shooting bedlam at Columbine High School comes up April 20, 2018, and the marches and calling out will be for legislation to order universal background checks, ban assault weapons and hefty bullet magazines, and universal Extreme Risk Protection Order (ERPO) actions by which family members may ask for an order to remove guns from a dangerous situation or person. For more see Every Town for Gun Safety’s paper on ERPO. DACA, however, was not legislated, but the bill’s authors say there is time to get it passed. Judges in New York City and San Francisco have stopped by injunction the president’s September 2017 roll back of the Obama policy to protect young undocumented immigrants from deportation. We hope this holds true because this blog and the news media will keep it up front when election season arrives. What else is happening this month or coming soon? Strikes of course. 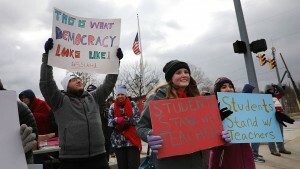 Beginning February 22, West Virginia’s teacher union led to a 5% better salary nine days later – March 2. The Peoria People’s Project with aid from Peoria Federation of Teachers called back on February 23, 2018, for the same access to excellent public schools as other richer areas of the city. Moreover, Janus v. AFSCME comes up before the United States Supreme Court over the same issue that was fought over in Friedrichs v. California Teachers Association. To recall, the issue was should teachers pay their fair share of dues, not to PACs or to support candidates, but to support negotiations for every teacher in the school district whether a union member or not. The difference in the Janus case is that corporations are trying to bust unions by making “right to work” the policy. In other words, an employee does not have to pay a yearly fee to the union, but still get the benefits. Let’s end this post with good news about the Schott Foundation’s “Loving Cities Index.” The report describes twenty-four community and school-based supports that provide children with equal opportunities to thrive and succeed. Under CARE the report looks for cities with good food sources, clean air, health insurance, for example. Under STABILITY the report looks for consistent Early Childhood Education programs, alternatives to expulsion, and anti-bullying programs among others in the community. Under COMMITMENT to support the student the report searches for public transportation, affordable housing, banking services and more. Last, CAPACITY in the city is measured, for example, by number of experienced teachers, well-resourced schools, and strong high school curriculums. Find out more about the “Loving Cities Index” that will make your community safe, schools well-provided for, and healthy to live in. This entry was posted on Friday, March 30th, 2018 at 2:35 pm	and is filed under American Federation of Teachers, California Teachers Association, public schools. You can follow any responses to this entry through the RSS 2.0 feed. Both comments and pings are currently closed.